Back in November, we did a post about The Perfect Baked Potato. 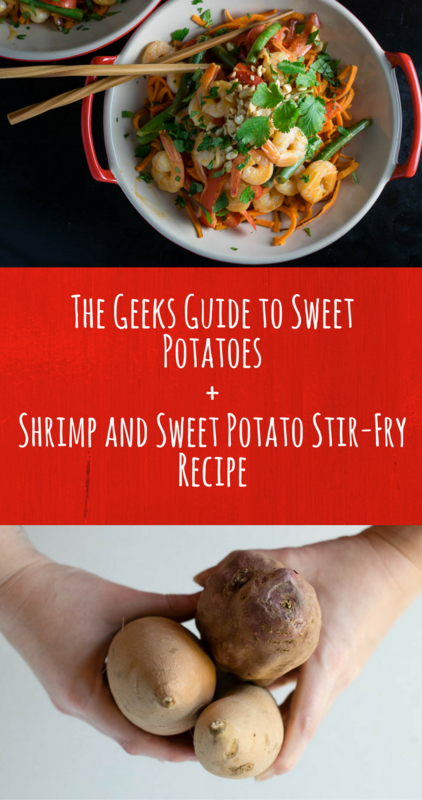 We received a lot of requests to do a similar guide for sweet potatoes. So here we are. Only recently have we become sweet potato fans. Believe it or not, there is far more you can do with them than the awful canned yam sugar bomb you’re served at Thanksgiving. 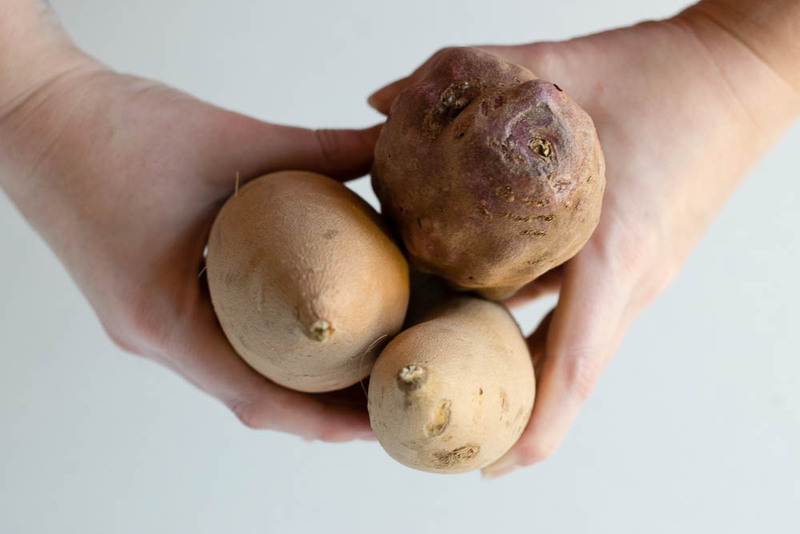 Jewel– We find Jewel Sweet Potatoes to be the sweetest. They are probably the most easily recognized. We really enjoy these as veggie noodles. They also really brighten up a stir fry (see our recipe below). Hannah– Hannah Sweet Potatoes are our favorite. They aren’t as sweet as their counterparts. They also make a delicious hash! Purple– Purple Sweet Potatoes are by far the coolest looking of the bunch! Their bright purple color is stunning when they are raw. Once cooked they are much darker and were perfect for our Rings inspired recipe. Noodles– Spiralize your sweet potato for a grain-free noodle option. The trick with these is to cook them just long enough. If you over cook them they will be mushy. Baked– Baked sweet potatoes are a great way to enjoy a savory preparation of a traditionally sweet food. Instead of your traditional baked potato, add a little salt and butter to your sweet potato. Sweet Potato Fries– One of our favorite ways to eat sweet potatoes! Sweet potato fries that are extra crispy and salty and a great way to change it up. Try dipping them in teriyaki sauce too! Above we mentioned using sweet potatoes as noodles. We have created a recipe doing just that! 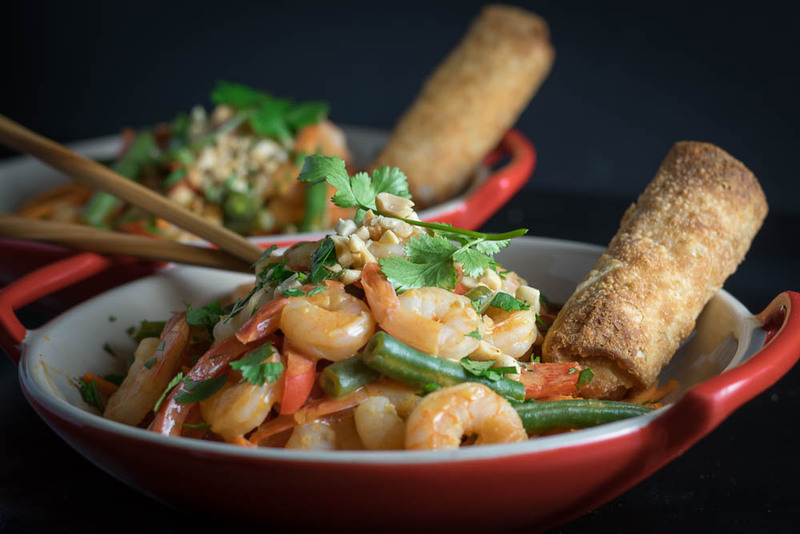 Our Shrimp and Sweet Potato Stir Fry is loaded with vegetables. We used a peanut coconut sauce along with red bell peppers to enhance the sweetness. Additionally, we added green beans which balance out the aforementioned sweetness. How do you eat your sweet potatoes? We’d love to see your recipes! Share your favorite recipe below for a chance to be featured in a sweet potato recipe round up! Heat 2 tbsp of sesame oil. Saute sweet potato noodles in oil. Cook until tender. Remove from heat and set aside. Heat remaining 2 tbsp of sesame oil. Add red bell pepper and green beans. Add shrimp and cook until heated through. Add sauce and cook until combined. Top with chopped peanuts and cilantro.